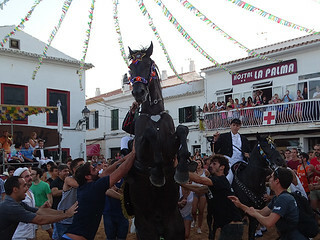 It is during the summer months when every town and village in Menorca celebrates their ‘fiesta’ popularly known as “Jaleo” (fuss), in which the stars are horses, mainly purebred Minorcan horses, which are of black coat, noble and energetic. In the ‘Jaleo’ the riders demonstrate their abilities by rearing their horses up on their hind legs, making them jump and dance to the rhythm of traditional music played by a brass band, while the crowd around tries touching them. Each town has its own flavour and scale but the programme is very similar in all of them except in Ciutadella, where the schedule is quite different, and the festival has been declared of International Tourist Interest. The ‘Jaleo’ is held over two days, one at daytime and another during nighttime. The ‘Fabioler’, as the leader of the parade, plays a flute and a drum while being followed by the horserider bearing the flag, and then the other horses. They parade by the main square in line and then the ‘jaleo’ starts. Horses enter the square in rows of two or three, depending on the number of horses participating. Sometimes these parades are accompanied by giants and ‘cabezudos’ (big-heads). Horses are dressed with ribbons and rosettes. The riders in a traditional white and black suit with a hat. After the second day Jaleo, a cane and a silver spoon are given to all the participants, among which are the priest and the mayor. Apart from that, as in most festivals, there are fairground rides, races, competitions, firework displays and evening concerts as part of these patron saint´s celebrations. These festivals have a religious origin, that´s why they are celebrated on the Patron Saint´s day of each village. The ‘Jaleo’ dates back to the fourteenth century. The oldest festivity is the one celebrated in Ciutadella, the San Joan Festival, on which other traditions such as medieval equestrian games are played to the delight of tourists and locals. In the old days it was thought that touching the horse´s heart or taking a look in the mirrow they have in its bridle, gave good luck. Nowadays the aim is more of helping horses and riders to remain standing. The typical drink of these festivals is the ‘pomada’, a pontent mix of Minorcan gin with lemonade. The Jaleo bus is a night-bus service from Minorca’s towns to and from the fiestas various locations. I visited the ‘Jaleos’ of Es Castell and Fornells because they coincide the same weekend. So the pictures shown here and in the Flickr album are from one of these two towns. Of course Minorca is a very beautiful island with coves of clear sparkling waters, but summer time is not the best time to travel there to discover them, as they are so crowded. By contrast, its megalithic constructions are not very visited yet, and Menorca is very rich in this kind of archaeological sites. So, perhaps you could choose one of the festivals in June or September and get to know something else apart from its swimming waters.